James Stevens Curl has held Chairs at three universities. An Honorary Doctorate of Arts was conferred on him by De Montfort University, Leicester in July 2014 'in recognition of a distinctive contribution to the study of architectural history'. In 2017 he was awarded the President's Medal of the British Academy for 'outstanding service to the cause of the humanities and social sciences' in his wider study of the History of Architecture in Britain and Ireland. His PhD was conferred by the University of London on completion of his pioneering study of the life and works of the architect, Henry Roberts (1803-76). 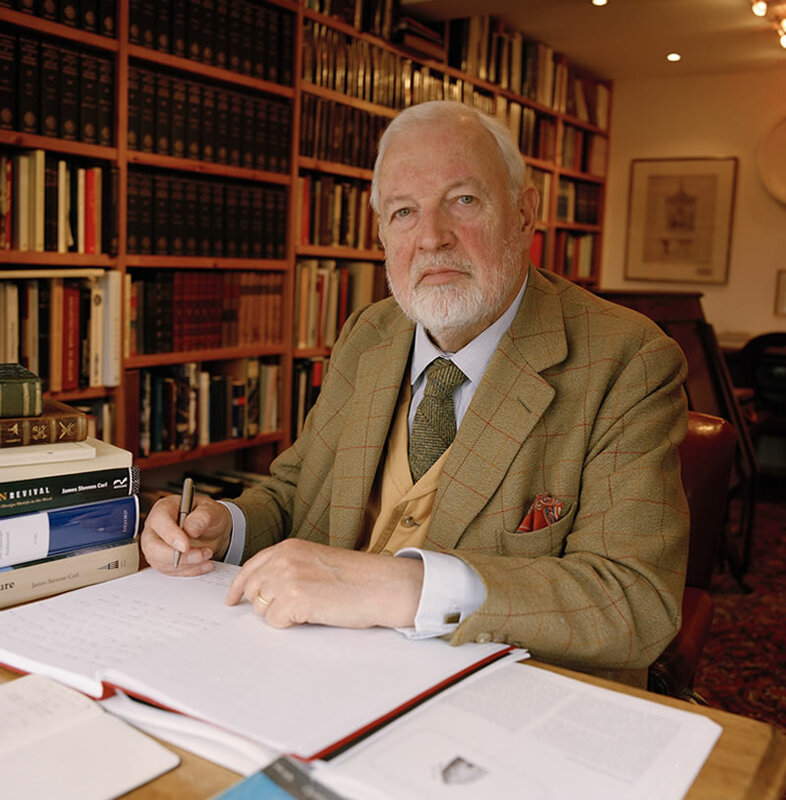 In 1991-2 and 2002 he was Visiting Fellow at Peterhouse, University of Cambridge, when he researched and wrote up his study of the impact of Edward Young’s Night Thoughts on the beginnings of the Garden-Cemetery Movement, and also worked on studies of 18th-and19th-century British architecture which resulted in the publication of two major books in 2007 and 2011. He has established an international reputation for scholarship, penetrating criticisms, lucidity of style, and thorough investigations in little-known fields of research. Making Dystopia: The Strange Rise and Survival of Architectural Barbarism with a Prolegomenon by Timothy Brittain-Catlin was published by Oxford University Press in hardback, pp 551 (Oxford: Oxford University Press, August 2018), RRP £45-00, ISBN 978-0-19-875369-8. This New Year has already seen the publication of the paperback The Oxford Dictionary of Architecture (3rd edition, March 2015) with contributions on Landscape by Dr Susan Wilson. RRP £11.99, ISBN: 978-0-19-967499-2. Visiting Professor of Architecture at the Faculty of Art, Design, & Built Environment, University of Ulster, from April 2015 for a four-year period. The Oxford Dictionary of Architecture in hardback, 1017 pp., many hand-drawn illustrations by JSC, with contributions on Landscape by Dr Susan Wilson (Oxford: Oxford University Press, March 2015), RRP £45-00, ISBN 978-0-19-967498-5. This became available in paperback in 2016 ISBN 978-0-19-967499-2. ‘London’s Derrie: the background to the building and financing of the walls’ in Walls 400: Studies to Mark the 400th Anniversary of the Founding of the Walls of Londonderry edited by Brian G. Scott (Londonderry: The Guildhall Press 2015) 13-35. ISBN 978-1-906271-99-2. JSC has also published numerous letters and book reviews in: The Times; Oxford Reference; The Times Higher Education; Perspective; and Mausolus, referenced in ‘Complete List of JSC Publications'. Architecture & Gallery: examples are given of JSC’s designs (architectural and other), book- illustrations, line-drawings, watercolours, etc. Contact: JSC may be contacted by email, telephone, or snail-mail.